In my most recent article I discussed a certain (currently popular) view that traditional "uke" aren't really all that useful in blocking/deflection/parrying. 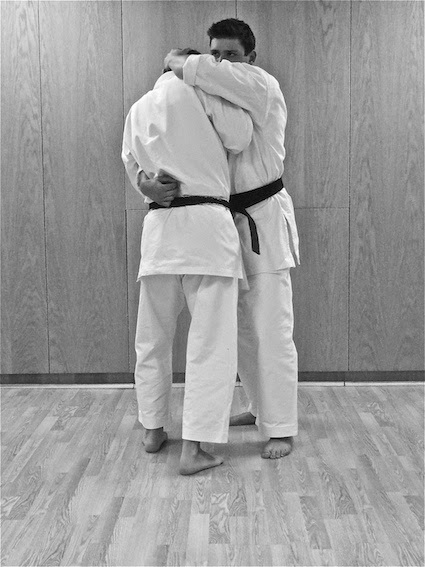 Under this view it is proposed that "uke" function more as as "striking, unbalancing, trapping and limb (and head) manipulation movements in stand up grappling" (to quote "jwt" - John Titchen). 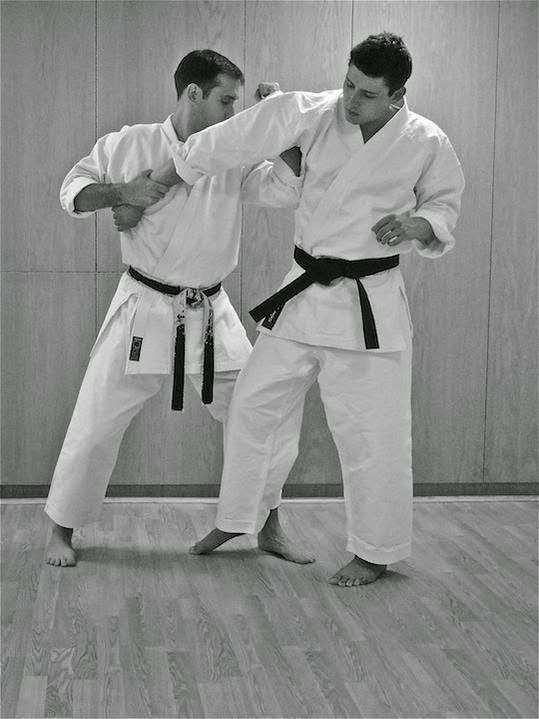 "[M]oving and manipulating others to gain a position from which to strike, control or escape (predominantly extracting oneself from multiple punches, grabs, high tackles and clinches)... make up the majority of the 'action' in close range combative situations and it is those movements which both full and partial Uke sequences excel at. " "[T]he majority of the movements being drilled [should] navigate the most common problems posed by violent incidents." For John this would not include "blocking" (parrying/deflecting etc.) but rather stand up grappling. My problem is that this philosophy doesn't square with what I know - about both civilian defence scenarios as well as the arts of grappling. In my experience as a former prosecutor there is a very, very strong desirability in civilian defence to stay out of the grappling range to avoid being taken down to the ground (or even trapped standing). I can't recall being part of a prosecution that involved a murder, grievous bodily harm or assault which was one-on-one, unarmed - other than a pub fight where they wrestled to the ground and the guy on top had his nose bitten off. Whichever way it goes, in each case going to a clinch led to being trapped - and spelled nasty things. Going to the ground was the beginning of the end - even for good grapplers (like the guy who no longer has a nose). And in my experience fighting a grappler (heck, even a gifted amateur, never mind someone with training or experience in wrestling), a stand up fighter who is careless will get taken down before he/she can say "boo". I discuss this issue at length in my essay "How civilian defence grappling differs from sport grappling". This doesn't mean that there is no "stand up grappling" in arts like karate. Quite the reverse. My article shows that in many situations arts like karate can and do utilise stand up grappling techniques. But my article also illustrates how careful the civilian defence grappler has to be to avoid being taken down while engaging in such "stand up grappling". are resorted to when the opponent has been sufficiently controlled or subdued (the opponent is off-balance or you're on his/her back, etc.). Whichever way it goes, the civilian defence fighter is very, very wary of the clinch. Because once you get to the clinch, most of the time you're destined for the ground. unarmed (as you'll see from my recent post on the subway fight). In an altercation my brother had a few years ago, both eventualities occurred: the burglar he wrestled had a knife. And he also had an accomplice, armed with a lump of wood. Staying on the ground quickly stopped being an option. First, almost all of them not only envisage a clinch range - they demand it. The attacker is already clinching (albeit in an amateurish way judging by his grip positions). 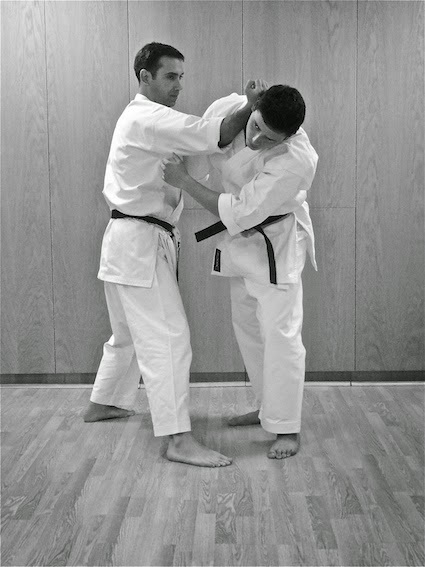 The defence involves using a forearm to push the attacker away (and assumes the weak positioning of the attacker's grip across the shoulder). Obviously I've been in such a close range many, many times (though generally with a more meaningful clinch). And I can assure you that even a beginner in BJJ, Greco-Roman wrestling or judo will have you on the ground within a second - with or without your "bunkai releases/escapes". Because you're basically up there playing the grappler's game. Except you're armed only with "karate grappling". The other guy is armed with either real grappling or a whole lot of vehemence and anger. This sort of scenario is not karate's - or any civilian defence art's - forte. If you don't believe me, go down to your local BJJ/judo/wrestling/MMA club and ask someone to get into this position with you - and see if you can make this work. I guarantee that even if you manage to push your opponent's neck, something very unpredictable will happen. And a millisecond later you'll realise you're on the ground and, sooner or later, on the losing end of a grappling match. Even if you're a good grappler, you're no longer doing "karate" - you're doing your BJJ etc. And as we've discussed, being caught up in a one-on-one grapple is far from ideal in terms of what civilian defence is trying to deal with. So in summation: to make any such "bunkai" work, you'd better be a darn good grappler to begin with. And you'd better hope that you're in a "one-on-one", unarmed environment as well. Then there's always the issue: "How well does "karate grappling" stack up to "specialist grappling". Okay, I'll admit it - this one is a perennial favourite of mine. I have used it for years and years. But when I've tried it out against grapplers, I realised it comes with a host of very severe limitations - ones which aren't exposed until you fight a grapper. For example I tried this fighting a guy in Hong Kong in 2009. He had me on my backside within a second, reversed the lock and almost broke my elbow (it was sore for the better part of a year). How did he do it? He just dived for my legs. In Hong Kong he dived between my legs (as would happen to John in these pictures). More recently I've had it happen by my BJJ students diving behind my legs (as per my picture below). Basically arm bars are all well and fine - but as soon as someone knows how to dive, you can virtually forget them - unless you keep in mind some pretty subtle (but significant) rules. Remember: your opponent is diving down - which happens to be the direction of your force on his arm. You're basically pushing him in the direction he needs to go to escape the lock - and the direction he wants to go throw you. Trust me - it's the ultimate trap. And almost no karateka seems remotely aware of this issue. I see bunkai being peddled all over the internet without a care in the world for fundamental issues like this: issues that are "no brainers" to specialist grapplers - but are somehow "esoteric" to the average stand up fighter (especially in a traditional martial art). Yes, there are ways to avoid a "dive" - and I cover some of them in my article "How civilian defence grappling differs from sport grappling". Mostly the kata shows you how - it's built into its throwing/grappling techniques. But guess where is it not "builit-in"? It's not built into "uke". Why? My guess is, it's because they aren't designed primarily to initiate grappling. They are for receiving attacks - not opening with them (as strikes, arm bars, levers and other manipulations). Kata moves that are obviously intended to be applied as throws take careful measures to avoid the grappler's counters: they stay clear of the clinch and, when a throw/lock is being applied, ensure that the form of movement avoids you being taken down into a grapple afterwards. Now I'll mention (only in passing) that John's arm bar is problematic from for another, completely unrelated, reason. What would that be? Why would these be a challenge? The lock looks strong - doesn't it? Don't we use it in the dojo all the time? For starters, in this "application" of an "uke" you are pushing on his tricep/shoulder. This is too, too easily resisted. I'm willing to bet that you won't get your partner down much farther than what is depicted in the opening photo of the bunkai sequence. You'd be better off pushing on the elbow (where you're at greater risk of his dive). But pushing up here on the tricep/shoulder just isn't going to get you anywhere. Okay, so the moral of the story is, don't play grappling games when your aim is civilian defence and your primary skill is stand up fighting. I'm fairly certain you'll fall foul of that famous cliche that "90% of fights go to the ground". While I don't think this cliche is necessarily true for civilian defence (as opposed to "chest bumping" displays of male dominance), it is definitely true if you intend to base your tactics on grappling. I wouldn't give you 10 seconds to remain standing once you start grappling "karate style". And even if you don't "intend to wrestle" (because you're just doing "releases" etc.) be aware that basing your fight plan entirely in the grappling/clinch range means that you'll wind up wrestling anyway - whether you like it or not. You can have a variety of "clinch releases" in your arsenal, but if this is all you think the many "uke" are about, I think you're missing something. So if the plethora of uke aren't about "stand up grappling", what are they about? Well I personally have no problem with "uke" being all about handling the first punch. To me (especially as a former prosecutor) that's always been a no-brainer. 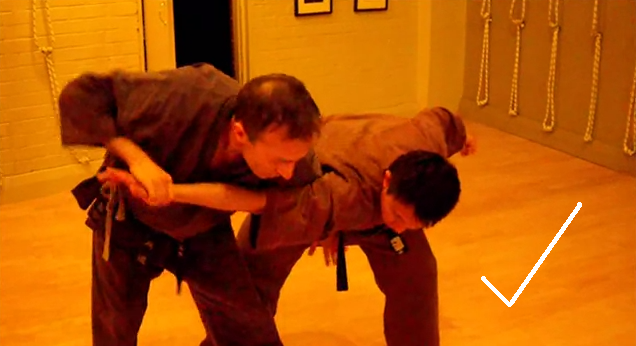 But uke are also about other attacks - not just strikes, but kicks and... attempted grabs - specifically for a clinch. If traditional civilian defence arts are about something other than the first punch, they are about avoiding the clinch! To me, this is the most pressing concern alongside not being punched/struck/kicked because this is what determines the outcome of the attack! It's hardly surprising then, that almost all "uke" can be put to effect to prevent a either a punch or a grab - whether around your neck, head, body, leg, or even your arm/wrist (as lampooned as that might be). The examples below of "uke" used to avoid the clinch are from taijiquan - but they could just as well be from karate. Look hard and you'll see lots of similar karate "uke" that prevent the grappler from reaching in and establishing a clinch. So civilian defence arts are, first and foremost "anti-grappling arts". This is by necessity. And to me, this is what makes John's thesis about "blocks" ("uke" as, first and foremost, instruments of stand up grappling) profoundly misconceived. They aren't "grappling" so much as they are anti-grappling - they negate it, they don't "encourage it". To the extent that civilian defence arts have "grappling techniques" (locks, throws etc.) these are short term, and engaged in from the melee range or in circumstances that are otherwise highly circumscribed. Where the grappler tends to feel at ease within the grappling range, the civilian defence practitioner is always striving to stay out of it - or get out of it as fast as he or she can. And this is for a good reason. Again, I encourage you to read my article on civilian defence grappling vs. specialist grappling. The civilian defence practitioner is trying to avoid being hurt. This means not being punched and not being trapped. "Uke" (blocks") serve both purposes well. They "receive" an attack (whether it is a blow or grab) in a way that prevents the attack working. This factor alone is more than enough reason to explain the high number of "uke" in traditional "stand up" civilian defence arts - be they Chinese (taijiquan, baguzhang, xingyiquan, Shaolin, etc. ), Japanese (karate) or Korean (taekwondo). Either that, or these arts are profoundly about grappling - using rather odd, less than optimal grappling moves (moves that no grappler in jujutsu, judo or wrestling would touch with a barge pole). Take your pick. The choice is stark. I have used John Titchen's pictures in the above article (I simply found them on a Google search and didn't know of him until recently) and I must concur with his assessment that I have done so unfairly: I have not featured the context of John's applications fully and in any event I will confess that I have been way too harsh in my criticism - particularly about the standing arm bar. In terms of the latter, I will also admit that this was one of my staple bunkai for decades - until a salutary lesson in Hong Kong in 2009 made me revisit the whole issue and come to different conclusions concerning the detail of standing arm bars. I am afraid I have not presented those conclusions here very well at all. I hope to remedy this in a future article in which I will explain my reasoning in a less critical, more constructive way that applies to us all and does not appear to single out one (very worthy and notable) karate practitioner! Sorry John! I hope you accept my apology.